O.K. What was I thinking? A little 6″x6″ painting I’m entitling “Prescott” this little guy is based on a salt shaker I picked up when I was about eight years old in Prescott Arizona. Let’s just say anyone in the house has been at risk of being painted as of late. He’s been featured in a painting some years ago as well, maybe you recognize him? So I commented to you in the most recent post that I’ve been cranking out a series of little 6″x6″ and 5″x7″ paintings, in fact I have finished now 43. Which is wonderful indeed, but wait, I need to frame these things now don’t I?! The blades in the shop have been spinning as I have been sanding down layers of paint off of old brick molding or reclaimed lumber and subjecting them to rabbits and ninety degree angles so they can be happy little frames. Then off to the porch or downstairs to the studio they have ventured to be lovingly brushed with varnish, stain, or oil paint. Hallelujah that the Oregon weather has been perfect for drying sticky wet things. Keep your eyes peeled for more results here. I’ve got to put a layer of burnt umber and quinacridone pink on a frame that is quietly looking homely just to my left right now. Time to give it a little attention. “Mr. 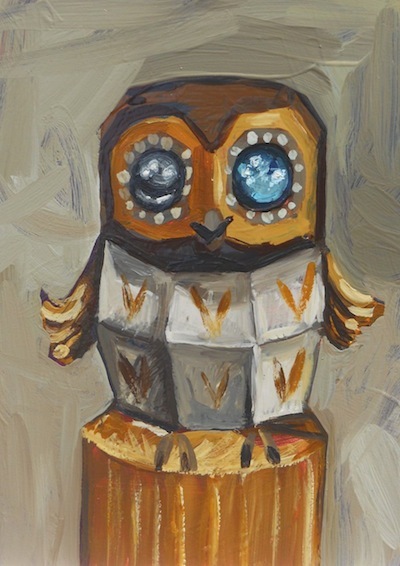 Bock” (5″x7″) was based on a little wooden owl I had around, but I decided to change the painted eyes into a ball bearing and a marble. I felt it gave him and interesting flair. 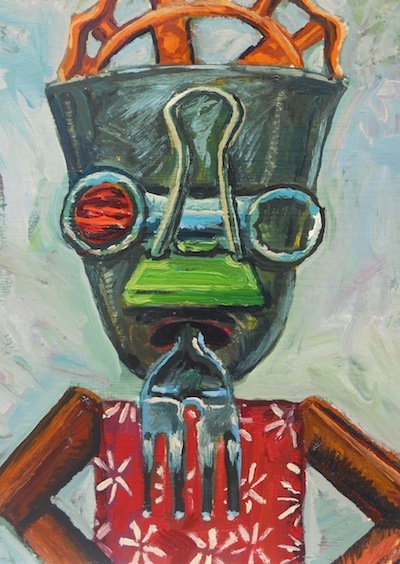 “Fork Mouth” (5″x7″) was thought up while sitting in a church service. Now I’m not saying their we’re untruths being spoken, I’m just saying that is where the idea for this little guy showed up. Make what conclusions you wish. 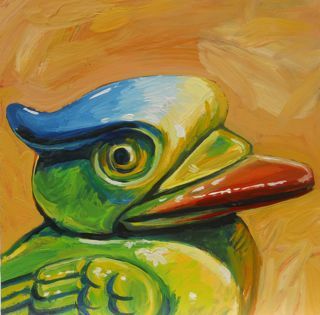 This entry was posted in Art in the Works and tagged assemblage painting, bird painting, fork mouth, making frames, owl painting, painting of a liar, small paintings. Bookmark the permalink. 1 Response to O.K. What was I thinking? You are so humorous!!! Your paintings are excellent, just like I remember when you were at Grand Canyon University…you were also an excellent teacher…thank you for being genuine!! !